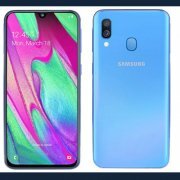 Recently, there has been much rumor about the Samsung Galaxy A40. The Samsung Galaxy A40 smartphone has finally arrived in Europe and it comes with a 25MP Selfie camera. The phone comes with the Exynos 7885 chipset, and a dual main camera. This smartphone comes with a 5.9-inch Super AMOLED Panel with full HD+ resolution. It has 4GB RAM and 64GB internal storage that can be expanded to 512GB with the use of a MicroSD card. 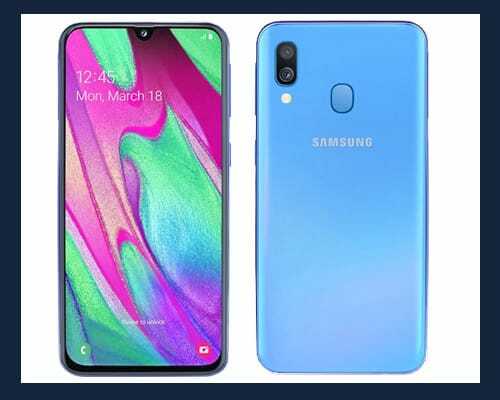 The resolution of the Samsung Galaxy A40 smartphone is 1080 x 2340 pixels, 19.5:9 ratio (437 ppi density). Galaxy A40 Phone dimension is 144.3 x 69.1 x 7.9 mm and it supports 2G, 3G, 4G, and 5G network. The operating system(OS) of the device is Android 9.0 pie. The device battery capacity is 3100mAh and it comes in Black, White, Blue, and Coral color. Samsung Galaxy A40 smartphone fingerprint is Rear-Mounted and the device has an accelerometer, gyro, proximity, and compass sensor. Below is the key specification, Full specification, and price of the device. Below is the Full specification of the Smartphone. The smartphone will be officially Launched on the 10th of April 2019. The price is budget friendly, it is set to be sold at €249. It is currently available for pre-order.